The Grant County International Airport boasts one of the largest airfields in the United States and is capable of accepting the largest aircraft in the world. The airport enjoys 350 days of excellent VFR weather and is regularly utilized by military and commercial test flights. The airport is a facility favored by military and commercial flight test programs. It has capacity to accommodate much more given its five runways and onsite FAA control tower for commercial, military, and general aviation use. Moses Lake boasts 240 acres of ramp space and 1 million sqft. of adjacent industrial park. Both commercial and military aviation can find expansive space to accommodate aircraft on the five runways, the longest of which is 13,503′ x 200′ feet long, without the congestion found at other facilities. 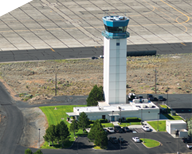 The FAA tower directs large dedicated flight zones for commercial, military, and unmanned aerial vehicle use at Grant County International Airport. The Port continues to expand! Major initiatives include: expansion of the East Terminal Apron adding 15 acres of new ramp, doubling the size of the industrial wastewater facility to contain over 50 million gallons, and constructing new warehouses for regional supply and distribution firms. Grant Count International Airport offers a secured airfield with a six-foot tall fence and three strands of barbed wire surrounding the 3,500 acre airfield. The gates accessing the airfield are on a card lock system and a background check is required before cards are issued. The airport has 24-hour security support onsite. A detailed selection of information pertaining to runway specifications as well as airport data on location, operations, communications, and ownership can be found on the Grant County International Airport Air Nav profile. Port of Moses Lake Air Traffic Control Tower provides air traffic support seven days a week from 0600 to 2200. Aircraft Rescue and Firefighting (ARFF) is available 24/7 to ensure the safety of all aircraft and Port personnel. Members of the ARFF team undergo constant training to continue meeting an FAA index D fire standard. 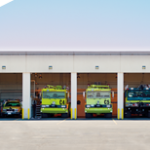 The ARFF index recently changed to the FAA index D requiring 3 trucks and 6,000 gallons of water, additional staff can be called in to meet FAA index E upon request. New Index D Fire Standard Airport Landing Fees are $1.10 per 1,000 lbs and assessed on aircraft over 12,500 lbs. 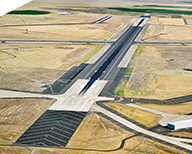 Working with the Federal Aviation Administration, the Port of Moses Lake has incorporated a specific section of airspace known as the North Training Area, designated to cater to aircraft testing and training. The Okanagan and Roosevelt Military Operations Areas combined are approximately 11,478 sq mi. (9,981 Nautical Miles). 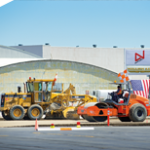 The special separated status in the North Training Area allows for testing and training to occur in an uncongested airspace designed solely for the advancement of the aerospace industry through test flights. Moses Lake is located along Interstate 90, providing direct, efficient access to the national road system. This connection provides business with access to the marine ports of Seattle and Tacoma for import and export cargo, and allows for cost-effective daily round trips to Seattle, Portland, Vancouver BC or Spokane. It also provides easy access to several rail loading facilities for movement of containers or bulk commodities anywhere in the US. 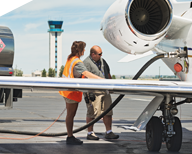 Million Air is an FBO equipped to supply Jet-A fuel for commercial, military and personal aircraft. Million Air previously assisted in the testing of Boeing’s 747-800. Million Air provides a full range of ground support services including flight test support. Columbia Pacific is equipped to provide aircraft maintenance, fueling and defueling, loading and unloading, as well as flight testing. The United States Customs and Border Protection office located within the Grant County International Airport is available 24 hours to clear international flights arriving at Grant County International Airport.